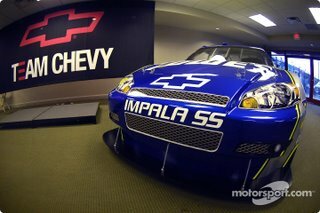 Jimmie Johnson's new Chevy Impala SS "Car Of Tomorrow" saw the light of day for the first time last week at Atlanta. The Impala is being rolled out for COT duty, with the tried and true Monte Carlo sticking around for the other 20 races next season. Despite videotape footage that appears to show a piece of roll bar padding coming out of Robby Gordon’s Chevrolet 35 laps from the finish of yesterday’s race at Atlanta Motor Speedway, NASCAR spokesmen say they do not anticipate any penalties to be assessed. Nextel Cup Series Director John Darby said his inspectors were ordered to inspect every car for missing roll bar padding as they were loaded into the haulers, but cautioned that he did not expect to apprehend a culprit, saying, “We'll be going through every car as they load them, but that's not to say it might not have been under somebody's seat." You can check out the footage and hear Gordon's comments by clicking HERE. Hornish Jumps On NASCAR Bandwagon: IRL Indy Car Series champion Sam Hornish will race part-time on the NASCAR Busch Series next year. He will begin by running at Phoenix and Homestead-Miami Speedways in the final two weeks of this season, before sharing the No. 39 Penske Racing South Dodge with Kurt Busch and Ryan Newman in 2007. Hornish said he still plans to compete full-time in the IndyCar series, adding, "I grew up wanting to be an Indy-car driver, but I have watched hundreds of NASCAR races. I always thought this would be something I'd like to try, and I feel this is the right time in my career. I still have a lot of questions in my mind as to how it's going to go." 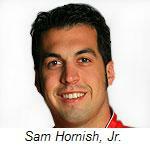 Hornish joins fellow Open Wheel drivers A.J. Allmendinger, Juan Pablo Montoya, Jacques Villeneuve, Max Papis, Patrick Carpentier, Adrian Fernandez and Michel Jourdain, Jr. as recent converts to NASCAR racing. Troxell On The Move: Evan Knoll confirmed yesterday that he will move Melanie Troxel and her Skull Shine-sponsored NHRA Top Fuel team to the Lucas Oil stables in 2007, running Troxel as a teammate to Morgan Lucas under the guidance of crewchief Richard Hogan. Knoll said of the Lucas team, "They've proven what they're capable of, and the fact that we're keeping the entire team intact should make for a very smooth transition." Troxel's current team owner, Don Schumacher, said last week that he has Troxel under contract to drive for him in 2007, but, "wouldn't stand in her way if she wanted to go." Knoll also said that an announcement is forthcoming on the future of Mike Ashley's Torco Race Fuels Dodge Charger Funny Car. Chevrolet Cutting (Bow)Ties: Chevrolet will end its full-time factory sponsorship of the Craftsman Truck Series next season, but will continue to provide technical and engineering support to teams. GM Racing’s Truck Series Manager, Dayne Pierantoni said, "Things are tough in Detroit, and there is some cost containment in place. We are going to have some changes in the way we support our teams next year." The team most dramatically affected by the decision will be Morgan-Dollar Motorsports, which has received factory backing for its No. 85 Chevrolet and driver Dennis Setzer, as well as its No. 46 entry, driven by a number of Nextel Cup Series drivers. Morgan-Dollar has already begun searching for new sponsorship. One of the most successful engine builders in the history of NASCAR, and a legendary MRN Radio broadcaster make up the National Motorsports Press Association’s Hall of Fame Class of 2007. 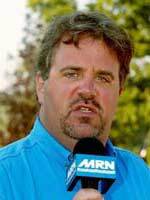 Situated high above the racetrack, MRN Radio’s Barney Hall has been relaying the action of NASCAR racing to fans for nearly five decades. Maurice Petty, head engine builder for Petty Enterprises for more than 30 years, helped guide brother Richard to 198 of a series-record 200 career victories. Halls’ distinctive voice is one of the most recognizable in all of motorsports, and he ranks as one of the most respected figures in the NASCAR Nextel Cup Series garage. He got his start working for a tiny radio station in his hometown of Elkin, N.C., in 1958, before working as public address announcer at what was then Bristol Motor Speedway. Within two years, he was hired by Bill France, Sr., as an announcer for what would later become MRN; the Motor Racing Network. Today, at 74 years young, Hall continues to be a fixture for the network, and an inspiration for us “young bucks” fortunate enough to work with and learn from him. Petty’s mechanical wizardry led to seven Cup Series championships, seven Daytona 500 victories and one incredible stretch that saw the Petty Enterprises team post 27 wins – including 10 in a row – during the 1967 season. In addition to his engine-building skills, Petty also made 26 starts as a driver at the Cup level, earning seven top-five and 16 top-10 finishes between 1960 and 1964. His best career finish was a third-place showing in 1961 at Spartanburg, S.C. He stepped away from the sport in 1985, but continued to stay involved, working with Dodge and helping prepare motors for the manufacturer when it returned to the sport. Diagnosed with polio as a child, Petty says the disease “has finally got me to where I can’t walk. I stumble around with a walker a little bit, but get around mostly with the help of scooters. I finally used up all the good muscles I had, I guess. Barney Hall and Maurice Petty will be officially inducted into the NMPA Hall of Fame in January of 2007. I expected the Open Wheel community to be upset over A.J. Allmendinger’s jump to the NASCAR ranks yesterday. I also figured my views on the rationale behind the move might ruffle a few feathers. I received a couple of angry e-mails from listeners after leaving the air last night, disagreeing with my contention that IRL and Champ Car are in danger of becoming Nextel Cup feeder series’, just like NASCAR’s Busch and Craftsman Truck Tours. Listener Dave Fothergill left little question about where he stands on the subject, writing, “You guys might as well make the switch to a full time NASCAR talk show and drop any discussion of the other forms of motorsports. Although some of the comments you guys made today were justified, the overall vilification of open wheel racing in North America has made it clear that Sirius Speedway really only cares about what's happening in the world of stock cars. Mr. Fothergill, I feel your pain. But I also think you have a short memory when it comes to this show. 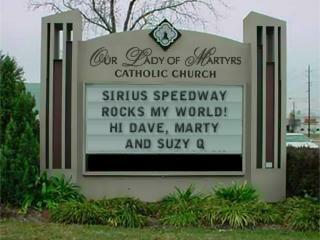 For the record, Sirius Speedway has covered Open Wheel racing – both Champ Car and the Indy Racing League – since our first day on the air. During the CART bankruptcy process, we kept listeners informed on the bidding war between Champ Car’s Kevin Kalhoven, Gerald Forsythe and Paul Gentillozzi, and IRL’s Tony George. We analyzed the means and motives of all parties, called in some of the most knowledgeable people in the business to get their take, and laid the facts out as best we could to let our listeners draw an accurate conclusion. We have been on the front lines of the IRL/Champ Car “reunification” debate from the beginning, honestly assessing the chances for a merger, talking with Open Wheel insiders to get their informed opinions, and offering our honest assessment on what ultimately turned out to be much ado about nothing. Over the past three years I have repeatedly stated my view that both Champ Car and IRL are slowly heading down the road to ruin, simply to satisfy the colossal egos of their respective owners. On that count, many of the sport’s most knowledgeable minds seem to agree with me. Now, with drivers like Allmendinger, Juan Pablo Montoya, Jacques Villeneuve, Paul Tracy, Max Papis, Sam Hornish, Patrick Carpentier, Adrian Fernandez and Michel Jourdain, Jr., all turning to NASCAR to one degree or another, it seems obvious that many of Open Wheel racing’s brightest stars have seen the writing on the wall, as well. Take a good, honest look at what’s going on, and tell me if most of the meaningful traffic in Open Wheel racing these days doesn’t seem to be heading out of town. I see it, and Robin Miller obviously sees it. Mr. Fothergill, what are you missing? NASCAR’s television ratings regularly dwarf those of the Indy Racing League and Champ Car World Series. Most weekends, NASCAR’s Saturday afternoon Busch Series race draws more viewers than both Open Wheel events, combined! NASCAR recently signed a new eight-year, $4.4 billion deal with four different networks; FOX, TNT, ABC/ESPN and SPEED. Champ Car and IRL pay to get their races on TV, because nobody will air them otherwise. Roush Racing boasts more corporate sponsorship than the entire starting lineup at most Champ Car or Indy Racing League events, and more cars attempt to qualify for the average Nextel Cup race than for the IRL and Champ Car race, combined. With all that said, I have just one question for Mr. Fothergill and his merry band of Open Wheel apologists. Am I the one with the blind spot here, or is it you? I do not speak critically of Open Wheel racing because I enjoy seeing it fail. On the contrary. I bemoan the current state of Open Wheel racing because I love all motorsports, and hate to see a once-proud group struggle so pitifully. I am old enough to remember the day – not so long ago – when if you asked a child to draw a picture of a racecar, he would draw an Indy Car. 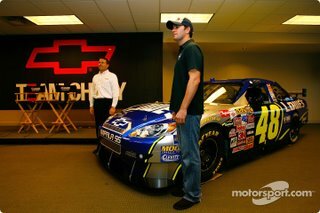 Today, he would break out the Crayolas and draw a picture of Jeff Gordon and the Dupont Chevrolet. NASCAR has spirited away most of Open Wheel’s fan base, and most of its corporate support, as well. Now, it has begun the process of skimming the best drivers from the top of the Open Wheel pot. The series that gave us Andretti, the Unsers, Mears and Foyt has fallen from its lofty perch, and impact with the ground is fast approaching. Somebody needs to pull the rip cord, but unfortunately, the men that run both the IRL and Champ Car continue to insist that they’re flying, not falling. We will continue to chronicle that story as it unfolds, and I will continue to criticize those who are selfishly allowing it to happen. Shoot the messenger if you like. Roush Racing has withdrawn the No. 06 Ford Fusion and driver David Ragan from this weekend's Bass Pro Shops 500 at Atlanta Motor Speedway, after Ragan failed to secure approval from NASCAR to compete. The team announced last week that Ragan would run both the Craftsman Truck and Nextel Cup races at Atlanta, but he is presently only cleared to run on mile tracks (or less) at the Nextel Cup level. His only other start prior to Martinsville came at Dover, where he crashed twice in 46 laps and finished 42nd. NASCAR spokesman Kerry Tharp commented on the decision Tuesday, saying, "There is an approval process in place, and his status will continue to be reviewed on a weekly basis. We take a lot of things into consideration: experience, qualifications, that type of thing. There's a NASCAR committee that convenes each week, and they will continue to review any application that he makes regarding the rest of the series." Ragan is still cleared to run this weekend’s Craftsman Truck Series race at Atlanta, but was not on the entry list Tuesday afternoon. That could change in the aftermath of his withdrawal from the Nextel Cup roster. A.J. Allmendinger will drive the new #84 Red Bull Toyota Camry for the 2007 NASCAR Nextel Cup Series season. That announcement was made earlier today by Team Red Bull, and completes a 2007 driver line-up that includes Brian Vickers in the #83 Red Bull Camry. Rick Viers, the crewchief who guided Allmendinger through two impressive NASCAR Craftsman Truck Series outings with Bill Davis Racing earlier this year, has left BRD to serve as Allmendinger’s crewchief at Team Red Bull. Appearing on Sirius Speedway Tuesday, Allmendinger talked about his reasons for changing series, saying, “The money is nice, I'm not going to deny it," he said. "But to me, the big deal was the opportunity to race for Red Bull. This team is going to give me everything I need to compete and race for championships. I know it's going to be tough, but I'm really excited about this challenge in my racing career. " AJ's Fiancee: "We're Going To NASCAR"
Drive another nail in the coffin of those clinging to the hope that Champ Car World Series star A.J. Allmendinger might find his way back to open wheel racing in 2007. Allmendinger’s fiancée was quoted telling friends last week, “We're going to NASCAR,” and my sources in the NASCAR garage say she knows what she's talking about. My sources in NASCAR-land say Allmendinger is being paid $200,000 a year to drive Champ Cars for Gerald Forsythe and Forsythe Championship Racing. I am told that Team Red Bull General Manager Marty Gaunt has offered Allmendinger a three-year NASCAR contract at three million dollars per year, plus percentages. Allmendinger’s management team has reportedly given Forsythe an opportunity to match that offer, but Forsythe has declined and broken off negotiations, saying the gap between what Allmendinger wants and what he is willing to pay is insurmountable. Forsythe currently has no sponsors, and runs his two-car team out of his own pocket. Sources close to the team now say they now do not expect Allmendinger to return in 2007. Team Red Bull announced late last week that Allmendinger will replace Bill Elliott in this weekend’s Nextel Cup race at Atlanta Motor Speedway. They have made no announcement concerning Elliott’s final scheduled start with the team; set for Texas Motor Speedway on November 5th, but Elliott said he does not expect that he will drive the TRB car again this season. 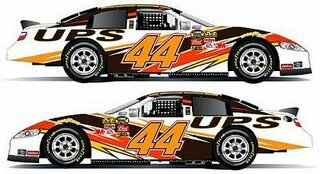 FIRST LOOK: Sources at UPS say this mock-up of Dale Jarrett's 2007 Toyota Camry is being circulated within the company this week. The car will officially be unveiled on UPS' website later today. 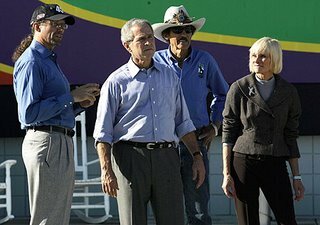 President George W. Bush visited North Carolina's Victory Junction Gang Camp yesterday, meeting with camp co-founders Kyle and Pattie Petty, and “King” Richard Petty. The Commander-In-Chief's visit included a fishing trip to the “Bass Pro Shop Catch, Kiss & Release Marina,” with the President joining campers Maddie Lee and Hank Grissom. Campers also challenged the President to test his skills on a NASCAR simulator. The "World's Most Powerful Ture Changer" also took part in a mock NASCAR-style pitstop. One more example of how it's good to have friends in high places! 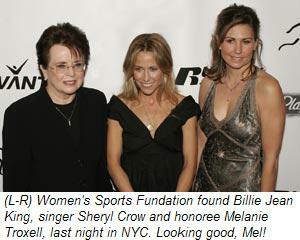 NHRA Top Fuel driver -- and Sirius Speedway favorite -- Melanie Troxel was honored by Billie Jean King’s Women’s Sports Foundation last night, as its 2006 Sportswoman of the Year. She was chosen from among 10 Sportswoman of the Year finalists at the Waldorf Astoria Hotel in New York City, where she was accompanied by her ever-loving husband, Funny Car driver Tommy Johnson, Jr.
Past winners of the "Sportswoman Of The Year" Award include golfer Annika Sorenstam, figure skaters Sarah Hughes and Michelle Kwan, and tennis legends Martina Navratilova and Chris Evert. Troxel is the first racer to win the award. Earlier this year, she was nominated for ESPY Awards as “Best Driver” and “Best Female Athlete,” and also beat out NASCAR’s Jimmie Johnson and IRL’s Helio Castroneves to win the First Quarter Driver of the Year Award; become the first female winner in the award's 40-year history of the award. Melanie will join us on today's show, to talk about the honor. In his new book, 'Awesome Bill from Dawsonville: My Life in NASCAR,' former NASCAR Nextel Cup Series champion Bill Elliott sharply criticizes NASCAR for failing to address safety concerns. His comments have received heavy play in the racing media recently, and Elliott will join us next Wednesday (October 25th) to talk about the firestorm they have created. In advance of his visit, I thought it might be helpful to let you read some of what Elliott has said about NASCAR and its devotion to safety. The following excerpt is courtesy of HarperCollins Publishers. "Dale's death uncovered some skeletons in NASCAR's closet. I thought the organization's emotional and forceful reaction to Dale's tragic death highlighted its comparative lack of concern for other deceased drivers. Remember, in years prior to Dale's passing we'd lost Adam Petty, Tony Roper and Kenny Irwin. No one rang any alarm bells when any of these guys died. No one called for investigations or softer walls, or HANS devices when these drivers died. But when Dale Earnhardt died, NASCAR went full bore, head over heels on safety. Whenever there is an incident on a NASCAR track, whom ever may be involved, the incident ought to be investigated so that it never happens again. We ought not only address incidents that kill stars. Shame on NASCAR for letting a handful of good men die before finally addressing the problem after Dale died. 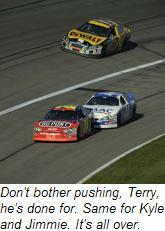 NASCAR had been urged for years to put black boxes — data recorders such as the ones you find in aircraft — in the cars. This would allow them to study the causes of serious accidents and work to prevent them. Black boxes only went into Cup cars in the last few years. If Dale had survived, it's likely other drivers probably would have been killed and no one would have cared. We all hate to see anyone injured or killed in a wreck, on track or off. I'm a realist — if it's your time, it's your time — but we need to do everything we can to prevent wrecks and to provide top-notch care for those guys who do wreck. Fans would be shocked to know how poor basic first aid is at many NASCAR tracks. Since emergency care is the responsibility of local track owners, the level of care is very inconsistent. I know of one serious wreck in recent years — I'll omit the track and the driver's name — where so many track workers crowded the car that the EMTs could barely get to the driver. It was mass confusion. I've been in so-called safety meetings where all it is, is a Joe Blow local EMT who works that particular race because he gets a hot pass. This is a true story: I had a guy after a wreck one time, a paramedic, who was riding with me in the ambulance. On the way to the hospital he actually asked me to autograph my oxygen mask for him. When I got hurt at Talladega the EMTs pulled me out of the car like I was weed. With the injury I had to my leg they could very easily have torn my femoral artery and I would have bled to death in minutes. Granted they were trying their best, but there was so much confusion. I was begging for a little professionalism. In the June 2004 Busch race at Kentucky, Buckshot Jones smacked into the wall in turn 1 and it took forever for the rescue crew to get to him. I'll irritate some people with all this, but I don't care. I'm at a point in my life and my career where safety is paramount. We should be on the leading edge of safety technology and be proactive about it. We could be the safest, most medically advanced outfit in sports. NASCAR should not delegate safety to track owners, when health care and technology companies would be lining up around the block to pay for the privilege of providing that care. No money would come out of NASCAR's pocket. I know all this for a fact because after my crash at Talladega in 1996, NASCAR asked Cindy to join a committee that would examine medical care within NASCAR. She spent a full year on that project, and by the end of that year she had a doctor lined up who had agreed to take all the liability off NASCAR's shoulders. Furthermore, Cindy and the NASCAR Wives Auxiliary were going to fund a mobile trauma unit that would travel, a la IRL, to all Cup races. In addition to the latest diagnostic equipment, it would have the up-to-date medical files of every driver onboard. Amazingly it wasn't until 2002 that such records were even kept at Cup races. Until then, if a driver was in a crash and he had no family at the race, medical professionals had no insight into his medical history. There are known cases of drivers racing with shunts in their head from previous injuries. I know this sounds crazy, but it's true. Clearly, the committee that Cindy was on had proven that we could easily have a unit like they have in Indy racing — a traveling team of a dozen or so trained specialists, including an emergency room physician — but NASCAR turned it down. They rejected both the doctor and the mobile trauma unit. We still don't know why. I think they felt that with such a unit there was still too much residual liability to NASCAR. That scares them. They simply don't want the liability of overseeing medical care, and as a result I think they want to mute the discussion on safety in general. If they brought in a fancy trauma unit, that would draw attention. They don't want to highlight the fact that racers are at risk or else they'd have to do even more. Instead they've been very successful at sweeping the risk under the rug. At each race every driver must sign a release form that waives NASCAR of any responsibility for injury or death sustained on the racetrack. As a result, no injured driver or driver's family has ever successfully sued NASCAR for damages. In my opinion, if you can't afford safety, if you can't afford the little things that can save lives of drivers, crews, and fans, whether you're racing Saturday night jalopies or Sunday in Nextel Cup, you ought not be involved in the sport. The next step is knowing what to do and having enough trained professionals and an organization that can make the right decisions. That's why I think the concept of safety needs to be imbedded at the youngest possible level. We need young kids and the people running their tracks to cover all the angles. I'll give you an example. My son, Chase, is a budding go-kart racer. He was racing one night and a kid suffered a pretty bad broken leg. They didn't have an ambulance there. Fortunately the track got in a little trouble for it. They weren't open the next week. I think NASCAR and the France family are sticking their heads in the sand. The IRL and CART have their own dedicated medical/rescue group that travels with the circuit; in fact, Cindy's proposal was modeled after the IRL plan. NASCAR leaves on-site medical care up to the individual racetracks. As a result you end up with a well-intentioned hodgepodge of local paramedics who have little knowledge of the specific safety and health issues that arise from 200-mph crashes and little personal knowledge of the drivers and their records. NASCAR should have top-notch specialists who travel to every race. NASCAR has gotten better as far as driver history and medical problems and whether a certain driver was in a crash last week, but they're still dangerously short of their potential. In Indy cars, each car is equipped with cross-beam lasers that are beamed onto the driver's head. These beams monitor head movement as well as the amount of Gs endured in a crash. The medical technician sits in a rescue vehicle that's outfitted with dozens of TVs and computer monitors. The instant there is a crash, the technician knows which driver's head moved the most and which driver endured the greatest Gs. Before the rescue vehicle even gets to the victim, the emergency crew knows the likelihood and the severity of injury. Several years ago in Germany, CART driver Alex Zanardi's car was split in half after he was hit in the middle of a spin. Dr. Steve Olvey, CART's longtime chief medical technician, was on the scene as he has been at virtually every CART race for the last quarter century. Zanardi, whose legs had been sheared off and who was bleeding profusely, was nearly dead when Dr. Olvey reached the car. But Olvey, who has dedicated his life to the care of drivers and the study of their crashes, made a lifesaving decision to skip the infield care center and fly Alex directly to a trauma center in Berlin. The quick decision making saved Zanardi's life. NASCAR also needs to do something to make the interiors of our cars roomier. They are so small and so cramped inside that it's hard enough to get into them. Try getting out during an emergency — even with the roof hatches, it's virtually impossible. The old cars from the 1970s and 1980s used to swallow me whole. Now I'm wedged in. They also need to do something to these cars to help minimize the left-side impact. We sit on the left side of the car. If you hit the wall or another car with your front, rear, or right, you're probably going to be okay. You take a car or a wall into your left side, or land on your left side as I did at Talladega, and all bets are off. NASCAR will tell you that the use of restrictor plates is a safety measure, and without a doubt it does enhance the safety of fans who no longer have to worry about cars launching into the grandstands, but I think they're actually using the cover of safety to manipulate the field into three-wide racing and closer finishes. In fact, you can make a pretty compelling argument that restrictor-plate racing causes more accidents because it congests the field. But three-wide racing and congested fields make for great TV. Plates have also changed the brand of driving, the brand of racing we do. Stock car racing used to be about just that — racing. Today it's far more about blocking, and that has given rise to all the bumping and grinding we see and to the heated tempers that are now on display virtually every week. The intended results for restrictor plates — cars that will stay on the track and out of the stands — have been great. The unintended consequences have NASCAR looking more and more like hockey. I expect the same thing from the new rpm rule that came in 2005. Under this latest rule, NASCAR engines are limited to 9,500 rpm. While NASCAR may say the rule is designed to reduce the advantage held by the wide-wallet teams, it's really just another way to crowd the field together. 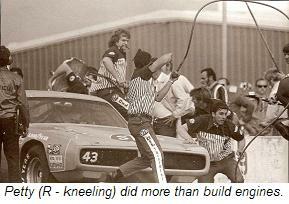 By the way, where was NASCAR in the 1970s and 1980s and when we were fighting all the big-budget teams? They were legislating against us! To their credit, NASCAR's done a good job lately of trying to enhance the restraint system. They've made the HANS device mandatory. They've put up the soft walls, and have taken a lot of credit for them even though the soft wall was really an IRL innovation. For a long time now our tires have had an inner liner to prevent or at least delay complete blowouts. We've removed doors; back in the old days doors would fly open during crashes exposing the driver to further injury. Sometimes they'd fly off and act as projectiles. Flaps on the roofs of NASCAR cars flip up the moment a car gets out of kilter. These flaps produce down force to keep the car on the ground. There is no glass on a NASCAR car. The windshield and right side and rear windows are made of Lexan, which is shatterproof. In fact, the headlights and brake lights on our cars are actually just stickers; there are no lights on NASCAR cars. Our fuel tanks or "cells" use flame-retardant technology adapted from Vietnam-era helicopters, and NASCAR has opened a facility devoted to safety R&D. There's been belated progress but we've got a lot further to go. You can express your concern, but unless the media gets behind you, you won't get any attention. Will it take another Dale Earnhardt? Will NASCAR continue to soft-pedal safety issues and then take a few baby steps every time a driver is killed or seriously injured? They can't hide now as well as they could in the past because the sport is under a much stronger magnifying glass. They'll respond as the circumstance dictates. But they never have been, and I'm convinced they never will be, proactive. If you go back in history and look at the way NASCAR makes decisions, you will see that virtually every major decision they've made on safety and plenty of other issues has been after the fact. They're reactive. It wasn't until I had the pit crew guys get seriously hurt in Riverside and a crew guy killed in Atlanta that NASCAR saw the dangers inherent in stock cars screaming into heavily populated pits. If fans only knew how thin NASCAR's protective measures truly are, they would be surprised. NASCAR not only leaves emergency care up to the individual tracks, it leaves decisions on personal safety equipment up to each driver. As of this writing, there is no rule requiring drivers even to wear gloves, fireproof or otherwise. Maybe I'm a little too outspoken on this, but I don't think you can be too extreme when it comes to safety. I think NASCAR should be on the cutting edge. If you're a premier sport, that's where you ought to be. 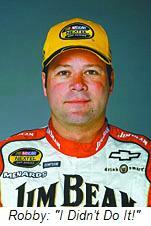 You would think it's impossible to fly under the radar while leading the NASCAR Nextel Cup points. But with five races remaining until the 2006 champion is crowned at Homestead-Miami Speedway, that’s exactly what Jeff Burton is doing. While so many around him fold under the pressure, NASCAR's version of Old Man River just keeps rolling along. While others find ways to turn certain victory into final-lap defeat, Burton brings home one Top-10 finish after another; bringing his Cingular Wireless Chevrolet back alive four times in five Chase races. One after another, his championship rivals climbed from their mounts with smiles on their faces Saturday night; Kasey Kahne in Victory Lane, with Jimmie Johnson, Dale Earnhardt’ Jr., and Kyle Busch not far behind. Those smiles disappeared with a single glance at the Lowes Motor Speedway scoring pylon, a glance that revealed Burton in third place. Have Earnhardt, Johnson, Evernham and their fellow title contenders run-up the white flag of defeat with five races still remaining? Not a chance. Their comments Saturday night were sincere to a point, but they also contained a hidden agenda. Like a High School football coach singing the praises of next weeks’ winless opponent, the rest of the Nextel Cup garage is searching for a way to throw Burton and the Richard Childress Racing juggernaut off its game right now. Maybe a little overconfidence will do the trick. Instead of analyzing all the pitroad chit-chat, Burton and his team will simply go back to work, working on their short-track program for Martinsville this weekend. For the record, Burton’s record on the bullrings is second-to-none, offering the Cingular Wireless bunch an opportunity to drive another nail in everyone else’s championship coffins. “The points system punishes you more for dropping out than it rewards you for doing good,” warned Evernham. “That's what they've got to watch. He hasn't had his bad race." And the way things look right now, he may not. One of the top two-wheeled racers of all time is coming to NASCAR. Ricky Carmichael announced today that he will join the MB2 Motorsports operation next season, after agreeing to a multi-year contract, beginning in 2007. The 15-time AMA national champion will compete in a developmental program of approximately 15 events in Late Model Stock cars, ARCA and possibly the NASCAR Craftsman Truck Series, with plans to accelerate that program in 2008. The 26-year old is also planning to run an abbreviated Supercross and motocross schedule next year with Team Makita Suzuki Racing. 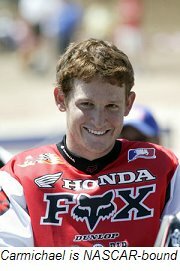 Carmichael announced earlier in the year that 2006 would be his final full-time season in Supercross and motocross. Since joining the AMA Motocross circuit full time in 1997, he has never lost an outdoor championship; with three straight 125cc titles, followed by seven consecutive 250cc crowns. His record also includes five indoor AMA Supercross championships. It's official! Michael Waltrip Racing announced today that Sirius Speedway favorite David Reutimann will become the full-time driver of the No. 00 Toyota Camry, co-sponsored by Burger King Corporation and Domino’s Pizza in 2007. Domino’s will serve as primary sponsor from the season-opening Daytona 500 through the May race at Darlington, in the August race at Michigan International Speedway, and in five races of the 2007 Chase for the Nextel Cup. Burger King will serve as primary sponsor in the remaining events. 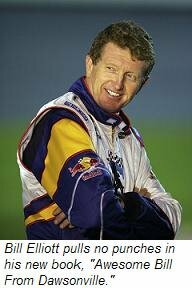 In addition to running full-time in the NASCAR NEXTEL Cup Series, Reutimann will also drive Waltrip’s No. 99 Aaron’s Dream Machine in the full NASCAR Busch Series schedule next season. The biggest winners last weekend at Talladega Superspeedway were not named Frank Kimmel, Mark Martin or Brian Vickers. Yes, Kimmel, Martin and Vickers all stood in Victory Lane at the end of their respective ARCA, NASCAR Craftsman Truck and NASCAR Nextel Cup events. But the big winners last weekend were Juan Pablo Montoya and A.J. Allmendinger; both of whom opened all the doors necessary to ensure themselves a long and lucrative career in NASCAR racing. Montoya – the former Formula One star and Indianapolis 500 winner – left little question that his adaptation to full-fendered stock cars will be a smooth one, qualifying on the outside pole, leading nine laps, and eventually finishing third in Friday’s rain-shortened ARCA RE/MAX Series event. There is obviously a substantial gap between ARCA and NASCAR Nextel Cup competition, but NASCAR veteran Mike Wallace – who finished sixth Friday – said Montoya has what it takes to succeed at the highest level of the sport. Montoya will continue his stock car education this weekend in ARCA competition at Iowa Speedway, but after Sunday, there is little doubt that team owner Chip Ganassi made a tremendous call in bringing the Columbian driver to NASCAR. Equally impressive was Champ Car phenom A.J. Allmendinger, who in only his second NASCAR Craftsman Truck Series start, wheeled a Bill Davis Racing Toyota to fifth place in Saturday’s John Deere 250 at Talladega. Allmendinger qualified 25th, but methodically worked his way forward, playing the tricky Talladega draft like a veteran. He bypassed numerous opportunities to make questionable lane-changes in traffic, and by mid-race, was solidly in the lead draft. He led a handful of laps, and by the end of the day, had convinced veteran drivers to jump out of line and draft with him. In typical Truck Series fashion, things got a little heated in the final few laps, but Allmendinger never lost his cool, putting his Toyota exactly where it needed to be to score an impressive top-five finish. As I mentioned during MRN Radio’s live broadcast Saturday, Allmendinger has already gotten plenty of attention from the Toyota camp, as it looks to fill its new NASCAR. If they don’t make the 24-year old Californian an offer he can’t refuse, there’s something seriously wrong with Toyota. Dale Earnhardt, Jr., may or may not be out of the 2006 NASCAR Nextel Cup championship chase. But either way, there's one important task still at hand. In the aftermath of Sunday's last-lap crash involving Earnhardt, Jimmie Johnson and eventual winner Brian Vickers, fans at Talladega Superspeedway expressed their disapproval by showering the racetrack (and anything else within range) with debris. 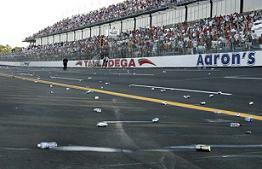 Beer cans, soda cans, seat cushions and all manner of debris poured down like rain, as members of Earnhardt Nation protested the unhappy outcome of the race. At least one child was reportedly injured by a thrown object, and numerous other fans, drivers, track workers and NASCAR officials were sent scurrying for cover in the face of the barrage. It was at least the third incident of this type in recent years, and in my opinion, that's three times too many. In April of 2004 -- also at Talladega -- NASCAR awarded Jeff Gordon the win after replay cameras showed the Dupont Chevrolet in front of Earnhardt as the caution flag flew on the final lap. Fans reacted with a rain of terror that was as dangerous as it was mindless. Amazingly, Earnhardt endorsed the barrage, saying, "Now my fans can finally have their chance to voice their opinion on how chickenshit that decision was." "You shouldn't do it," admitted Earnhardt, "(but) in a way, I look at it as a pure form of expression, which is really rare in sports." Junior was wrong about that. What happened at Talladega that day was nothing short of hooliganism; the sort of mindless, gang mentality that should be confined to European soccer pitches, not NASCAR speedways. What happened that day -- and at least twice since -- tarnished the image of this sport, and reinforced the outdated stereotypes we've been working for decades to shed. To many people around the nation, NASCAR fans are nothing more than tabacka-chewin', beer-swillin', overall-wearin', dentally impaired yahoos. What happened Sunday at Talladega does nothing to dispell those myths. In fact, it reinforces them. NASCAR can do little to stop the insanity. Local law enforcement is relatively powerless, as well, since arresting a few dozen would-be Roger Clemens' cannot possibly stem the tide of thousands of airborne Budweisers. There is only one person who can put an end to this disturbing trend, and his name is Dale Earnhardt, Jr.
Hopefully, America's most popular racecar driver will come forth in the next few days and say what he should have said in April of 2004. Hopefully, he will condemn the conduct of everyone involved in Sunday's embarrassing outburst, stating in no uncertain terms that he wants no part of any "fan" who acts in that way. Hopefully, he will retract what some people obviously considered his endorsement of similar conduct in the past, and make it clear that if you plan to act that way in the future, you need to take off that red #8 T-shirt and find something else to do with your Sunday afternoons. Jimmie Johnson -- whose fans also had reason to be upset Sunday -- said it perfectly when he told reporters, "We've got a huge fan base...that is going to express their feelings. Going to events and booing other teams is just a part of that. All I would ask is that people do it within reason, without jeopardizing other people's safety. I understand that a young child was injured by something that was thrown, and there's no call for that. Boo all you want to, express your displeasure, fill all the chat rooms with your comments, but injuring people is over the line." Junior, the racing world needs to hear the same from you, and the sooner the better. Stop the insanity, before it's too late. When he saunters through the gates at this weekend's Torco Racing Fuels NHRA Nationals in Richmond, Virginia, NHRA.com's Rob "Dog" Geiger will quietly pull the trigger on his 200th consecutive NHRA event. Geiger's openness and sense of humor made him a favorite of Sirius Speedway listeners more than two years ago, and his weekly drag racing updates have long been a can't-miss part of our weekly lineup. Congratulations, Dog, and here's to at least 200 more without a break. It's Just Not Meant To Be: In the aftermath of Sunday’s karma-rich “Banquet 400” at Kansas Speedway, I have come to a couple of conclusions. 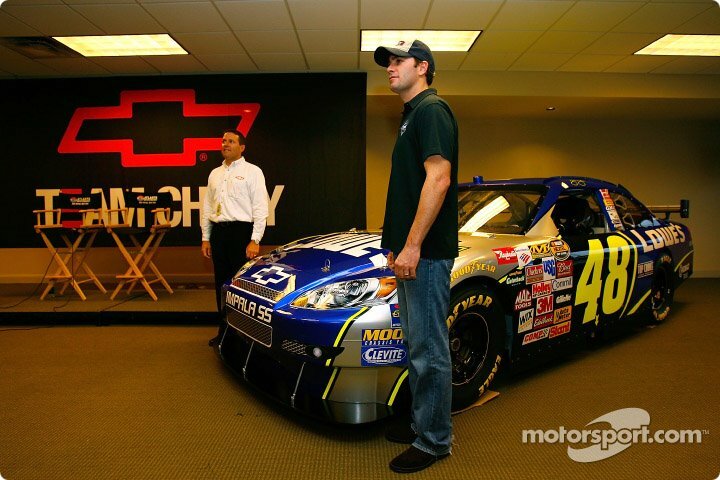 First, Jimmie Johnson and Hendrick Motorsports are destined to lose the Nextel Cup, again. Johnson had Sunday’s race won. He was cruising along with a healthy lead, needing only to make a routine, splash-and-go pitstop in the final laps to claim victory. A win in Kansas would have put him back within arm’s reach of the title, but instead, he watched as Kasey Kahne’s bizarre pit road spin – something that never happens at Kansas – aborted his first attempted stop. He then got busted for speeding on his second try, turning him from “sure-winner” to “14th-place finisher” in the blink of an eye. Johnson is now 165 points behind, in eighth place. Worse yet, the Gods themselves seem to be frowning up him and his team. The situation is equally bleak for Hendrick Motorsports teammates Jeff Gordon and Kyle Busch. Gordon had a top-three finish in the palm of his hand Sunday, only to have a camshaft failure cause his fuel pump to cease operating with 29 laps to go, sending him behind the wall. The debacle dropped him four positions to sixth in the title chase, and caused him to publicly second-guess the string of mechanical failures that has plagued the Hendrick team during the Chase. Busch, meanwhile, has had luck worse than the Buffalo Bills and Chicago Cubs combined, making his championship drive fall flatter than a cow pie on a rainy day. The fourth Hendrick driver, Brian Vickers, is running well, but that doesn’t count. He’s not even allowed to attend team meetings anymore. Simply put, the Hendrick Motorsports championship drive is kaput. Second, Jeff Burton is the chosen one. Ryan Newman flat-out wrecked in front of him in the early laps Sunday, only to have Burton two-foot the brakes and somehow avoid making contact. Ninety-nine times out of 100, Burton piles into Newman and finishes 42nd on the day, putting his title dreams in serious jeopardy. But Sunday, Burton parted the waters like Charlton Heston, slipping past Newman’s spinning Dodge without so much as a crease, en route to a fifth-place finish that boosted his championship lead to 60 points over Denny Hamlin. Burton fans, there is no reason to sweat Talladega this week. Your driver has been annointed from on high, and no evil can befall him. Kansas Robbery Update: Two men with lengthy criminal records have been charged in connection with Sunday’s robbery and shootout at the Kansas Speedway. The incident left an off-duty police detective critically injured, and the men were jailed early Monday on suspicion of aggravated battery of a police officer and aggravated robbery. Police are not releasing many details of the incident, which occurred at about 8 p.m. Sunday, after most of the crowd had left. The men attempted to rob a secure building known as “the bank,” where vendors take the day's receipts. Police would not say whether the men were employed at the track, but said they were believed to have passed through restricted areas. The off-duty detective exchanged fire with the suspects, who then fled on foot before being caught. One suspect has a record dating back to 1971, with convictions for first-degree robbery, felonious assault, bank robbery, conspiracy to distribute a controlled substance and being a felon in possession of a firearm. His alleged accomplice was convicted in the late 1970s of using a firearm to commit a felony, and carrying a concealed weapon. Doctors upgraded the condition of the injured officer to fair condition yesterday. Police spokesman Capt. James Brown said, "She is doing better. There will be some more medical procedures that she will have to undertake this week, so our prayers are with her, and we hope she gets through that with no problems." She is awake, and has been contributing to the investigation. For a video update on the story, and the injured officer’s condition, CLICK HERE.